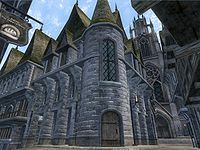 Glarthir's House is in the southwestern corner of Skingrad and reflects the Bosmer's personality. Along the southern wall on the ground floor sits a wicker basket with an impressive stash of 800 gold. Many books litter the floor and bookcase including four copies of Mysticism and The True Nature of Orcs, The Brothers of Darkness and the Spirit of the Daedra. On the second floor, two chests contain valuables, while the other chests contain clutter. The locked cupboard at the base of the stairs serves as an armory, containing an iron battle axe and dagger, and a fine iron mace. Glarthir's bedroom is on the third floor and contains numerous chests and paintings. The chest to the left of the large painting contains valuables, while the chest on the right contains low level weapons and armor. Seven Septims sit atop the clothing drawers overlooking the staircase. Finally, Glarthir's battle axe sits atop a stool next to his bed, until he takes it during his associated quest. The basement is that of a typical house, contrasting greatly to the floors above it. Three bread loaves, two ears of corn and two heads of lettuce sit on a shelf, while a pumpkin rests beneath the unit. The cupboard and two barrels along the north wall hold more food and another loaf of bread can be found next to some cheese on the adjacent table. Three cupboards and two barrels contain yet more food, as does a sack of grains on the floor. Glarthir has also hung four garlic clusters around the central pillar. The most intriguing part of the basement however, is the writing desk in the south-eastern corner, which holds Glarthir's observations on the people 'conspiring' against him. Depending on the decisions you make during the quest, different notes could be lying here. Glarthir has also hidden his secret key behind a pewter bowl on the shelves to the right of his desk. This key opens the cupboard with weapons in it on the second floor. Esta página foi modificada pela última vez à(s) 12h50min de 8 de junho de 2013.